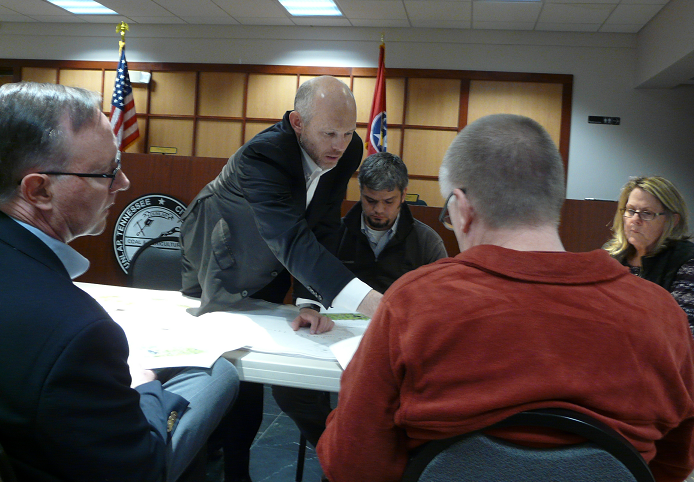 Karen House : Feb. 7, 2019, 6:48 p.m.
Landscape architect Ben Farmer gave an update on Harris Park Phase 2 at a Dunlap City Commission working session Jan. 30. L-r: Comm. Jeff Harmon, Farmer, Comm. Allen Jones, Comm. Bryan Harmon, and Vice-Mayor Judy Layne. Feb. 7, 2019 – At a city working session, landscape architect Ben Farmer informed members of the Dunlap Board of Commissioners that although Harris Park Phase 2 has not yet broken ground, the deadline to have the project completed looms just five months away. Farmer said the project is supposed to be “built, done, and closed out” by then, although nothing so far has been done on the project, other than the plans Farmer's design firm has drawn up. Although Mayor Dwain Land was out of town when the working session was convened on Friday, Jan. 30, the four members of the city commission were present to hear Farmer's update on Harris Park Phase 2. Governor Bill Haslam came to Dunlap nearly three years ago, on July 29, 2016, to award a $500,000 state grant for the project, along with a $200,350 grant to construct an access road for Precision Aerodynamics' new location for its parachute plant. And while the plant's access road has already been completed, the park project has yet to begin. 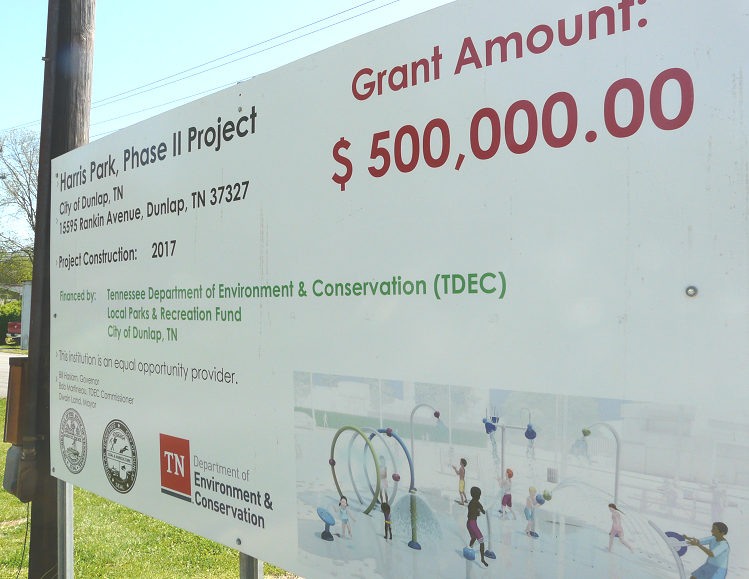 The half million dollars the state provided through the Tennessee Department of Environment and Conservation (TDEC) is supposed to help construct a splash pad and a farmer's market pavilion at Harris Park. Dunlap issued bonds to pay for the million-dollar project, which reflects the state grant and the city's match of those funds. The state will reimburse the amount of the grant once the project is finished. The delay in construction has been because bids are coming in over budget, according to Farmer. Part of the reason is the rising cost of building materials. An improving economy has caused a boom in construction, the current trade war has made materials more expensive due to scarcity, and the state requires construction utilizing grant funds to use materials made in the USA. However, another contributing factor to the increasing cost of Harris Park Phase 2 is changes in plans. Finding more funding for a larger project is “what Mayor Land does best,” Farmer said. The project, budgeted for $1 million, now stands at $1.521 million – more than 50 percent over budget, primarily because the size of the proposed splash pad has been expanded to almost 5,000 square feet, Farmer told commissioners, and the farmer's market pavilion has been made more “elaborate” to accommodate future use by Valley Fest. Dunlap News asked both Farmer and city officials for the original dimensions of the splash pad and the pavilion, and the dimensions as currently proposed, but has yet to receive them. The next regular meeting of the Dunlap City Commission is Thursday, Feb. 21, at 6 p. m. on the second floor of the Wagner Municipal Building. Meetings are open to the public. This sign at Harris Park is the only progress so far on Harris Park Phase 2, although the deadline for completion is July 1. File Photo.